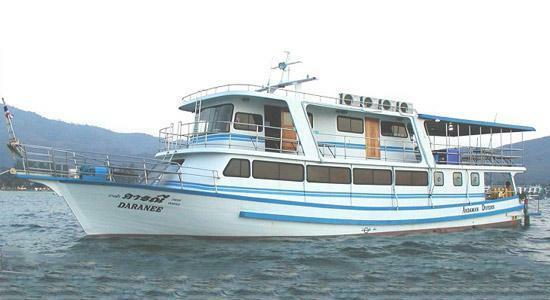 For safe, comfortable and low-priced liveaboard diving in Thailand, MV Daranee is one of the best boats. No more than 18 guests join each trip, and they stay in twin or four-bunk cabins, all of which have air conditioning. At 24 metres in length, Daranee is average size for these kinds of trips, but with fewer guests on board than most others, there’s more room to move around. 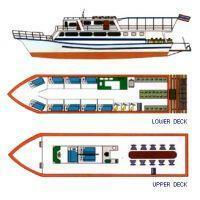 Passengers, can socialize in the dining area or sundeck, or find some privacy to read a book or sunbathe in peace. Great food is available throughout the day, and consists of freshly-cooked local & western cuisine. While the dive centre for MV Daranee is based in Patong, Phuket (and has its own guest house) for Similans trips the boat sails from Tab Lamu Pier in Khao Lak, about 100km north. Guests are transported for free, some being picked up on the way, to the pier in Khao Lak, where Daranee sets sail in the evening. Most trips are 4D/4N and offer 14 fantastic dives at Thailand’s best dive sites, starting at The Similans and gradually moving north to Koh Bon, Koh Tachai and Richelieu Rock – one of the best dive sites in the world. There are 3D/3N trips to Hin Daeng & Koh Haa during the season, at reduced prices. 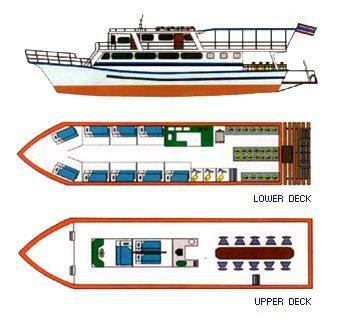 MV Daranee is owned and run by one of Phuket’s most experienced PADI 5 Star dive centres, and this means that each trip is well-planned to maximize safety, comfort and enjoyment. The small number of guests on board enables the tour leader to know everyone and ensure that they are diving in the right groups & conditions to get the most out of every dive. Divers enter the water from the large dive platform at the back of the boat and are normally retrieved by the inflatable dinghy, but sometimes return directly to the ship. In addition to retrieving divers, the dinghy can be used for short excursions to the uninhabited islands and pristine beaches, thus making the most of each surface interval. MV Daranee may not be as glamourous as some other Similan diving safari boats, but the attention to detail and personal service are worth more than a lick of paint and posh cabins. Daranee usually leaves from Khao Lak's Tab Lamu Pier for Similan trips, and from Chalong Pier in Phuket for Southern Andaman trips. The boat always departs in the evening and returns mid-late afternoon. Max. No. Of Guests: 18. Cabins: 7 Twin Bed And 1 Four Bunk. Bathrooms: 3 Showers / 3 Toilets. Compressors: Bauer Mariner. 2 Sets. Engines: 2 Hino Ek100 380 HP. First Aid: Oxygen First Aid System. Navigation: GPS Navigation System, Sounder AndRadar. Safety: Ship-to-Ship Radio, 4.2m Tender With 25hp Yamaha Engine. 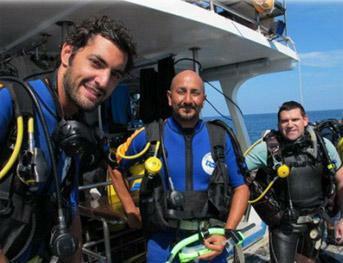 Courses are easily taught on liveaboard trips. In fact , it's the best place to do one. There are lots of options available, from a one or two dive mini-course, such as Deep Adventure Dive, to an Open Water Diver course for those who have never dived before. 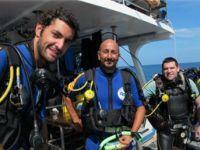 By far the most popular diving course on a liveaboard boat is the Advanced Open Water course. While the pricing of the diving coures on this particular boat is still under construction, please contact us for quotes and advice for taking part in a PADI or SSI diving course on this liveaboard cruise. Guests should arrive at the Daranee office in Patong, Phuket on the day of departure or before. Scheduled transfers from around certain areas of Phuket (and sometimes Khao Lak) can be arranged. Prices are 'per diver' and do not include diving equipment rental (if required @ 500 THB/ day) or National Park fees (1,800 THB/ 4-night trip). 3-night trips are 1,100 THB/diver/trip.